PRODUCT DESCRIPTION: A granular material which will last up to three months when sprinkled outside. 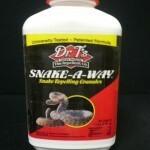 It has a slight odor which snakes can detect but people and pets don't. It is designed to withstand rain and weather and last up to three months per application when used with a granule guard. WHERE TO USE IT: For use outside. Apply it to create an invisible "fence" over which snakes won't cross. 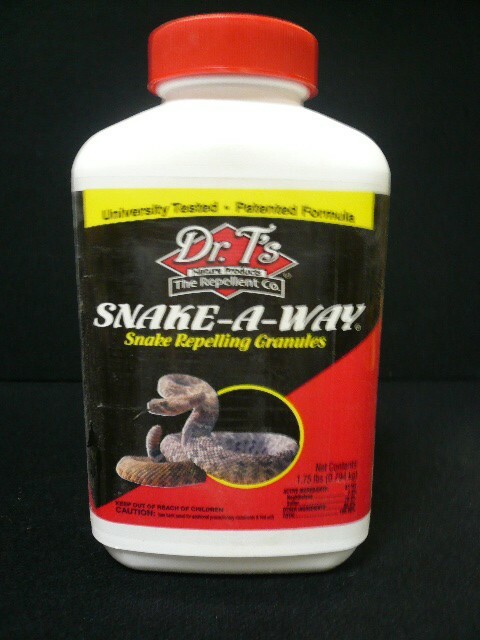 Use it along property lines to keep snakes out of your lawn and garden. You can also broadcast Snake Away over large open areas like lawns or mulch islands. RATE OF APPLICATION: 1 lb will create a barrier 65 feet long when using it as a "fence" or border. When broadcasting over open areas, use 1 lb for every 200 sq/ft. When used in a Granule Guard, place 4 oz of repellent per guard and locate them every 15 feet. Closer placements may be needed depending on local snake populations.